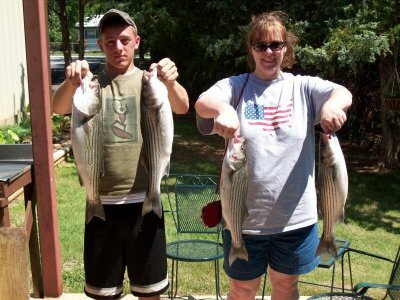 Another week of fantastic Lake Texoma striper fishing since my last report has been fantastic. The current lake level is at 618.04 with a water temperature of 75 degrees. The water is still a little off color. I’m fishing both morning and afternoon trips with excellent results. I am fishing live bait (threadfin shad) while mainly on anchor. in depths, anywhere from 15-45 feet of water. I'm still have been concentrating on humps, ditches and ledges. Topwater fishing has been good. The bait fish are along the banks spawning. Look for the Egrets and Blue Herrings lined up along the banks. Work your topwater lure (Chugbugs) along the shoreline. Also check out the windblown points, we've had plenty of wind lately, as we have seen good results here also. The quality of the stripers being caught has definitely improved. 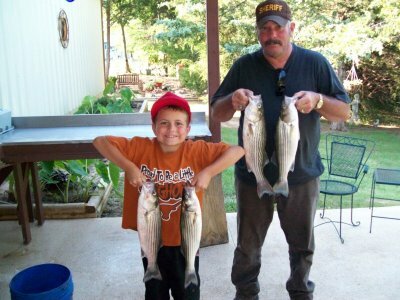 We are catching alot of fish over 20 inches, make sure you only have 2 over 20 inch stripers in your box for each person fishing. We are also loading the box with loads of good 16-19 inch box fish. In other words, Lake Texoma Fishing is at it's best. With the summer season upon us and schools getting out over the next week, we will se a great increase of traffic on the lake. Be aware and have a safe and enjoyable day of summer fun, fishing on Lake Texoma.